The numbers listed next to Josh Erickson’s name do not scream power forward. Yet Erickson, a junior from Roseau, approaches every shift with a crash-and-bang mentality, which is to say he’ll hit anything that moves. As an added bonus, there’s a decent likelihood he’ll score or set up a goal, too. 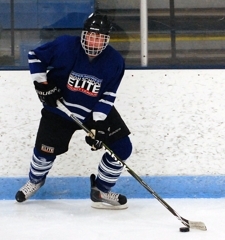 “That’s just the way I like to play,” said Erickson, a forward for Great Plains in the Upper Midwest High School Elite Hockey League. 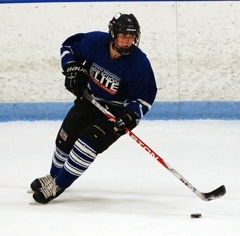 Erickson has scored four goals and four assists in 13 Elite League games this season. Unfortunately for Erickson, hits are not tracked as an official stat. 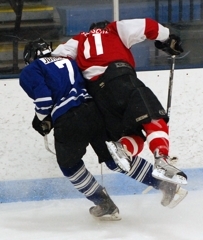 Pound for pound, he just might be the toughest guy in the league. 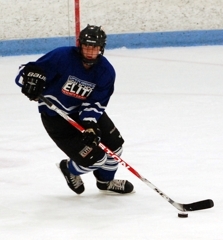 As a sophomore for Roseau last season, Erickson scored 12 goals and added 14 assists for a Rams team that reached the state Class AA tournament. 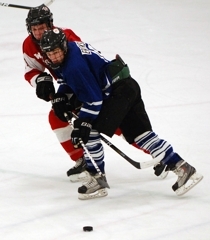 This season, he’ll be relied on to join senior Shane Omdahl in shouldering much of the Rams’ scoring load. One of the teams Erickson and Roseau will have to contend with in Section 8AA is Brainerd, and the Brainerd Civic Center Arena was the site of Great Plains’ 4-2 loss to Team Wisconsin on Saturday, Oct. 16. “It was crazy in here last season,” Erickson said about the Rams’ regular-season 3-2 upset loss to the Warriors. The Rams avenged in a 3-2 double overtime win in the section semifinals. “We had some great games with them,” he said. 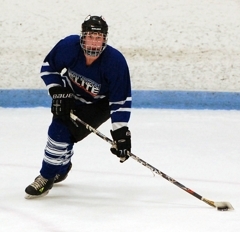 Erickson’s fearless playing style has attracted the attention of college recruiters. He has been in contact with Bemidji State and watched the Beavers’ lose to the University of North Dakota in their debut at the new Bemidji Regional Events Center. 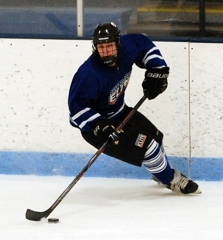 The senior from Waupaca continued his strong Elite League season by scoring his 12th and 13th goals of the season. With Great Plains trailing 3-2 and trying desperately to forge a tie in the third period, the deceptively fast Navin scored a backbreaking goal on a breakaway. A senior from Eau Claire Memorial, Soley made 12 of his saves in the first period to keep the score tied at 1. He finished with 26 saves to boost his Elite League save percentage to .906 and lower his goals-against average to 3.72. A junior from Grand Forks Red River (N.D.), Fugleberg scored in the third period on a power play to help Great Plains close to within 3-2. 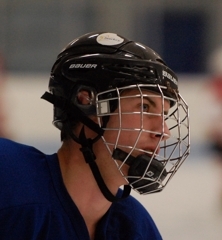 He was a big part of an effective forward unit that included Bryant Christian of Moorhead and Micah Ranum of Thief River Falls. 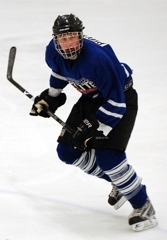 One of the strengths of Great Plains this Elite League season has been its defense, and the pairing of Mark Bittner of Crookson and Jeremy O’Keefe of Grand Forks Central, both seniors was steady against Team Wisconsin as was the duo of Tucker Poolman of East Grand Forks and Keaton Thompson of Devils Lake, N.D. The third pairing -- Brandon Tendeland of West Fargo and Garret Schmitz, the junior from Red Lake Falls with the cannon shot -- also was solid. The defense even got involved in the scoring, as Bittner and O'Keefe each registered an assist on a first-period power-play goal by John Simonson of Grand Forks Central. 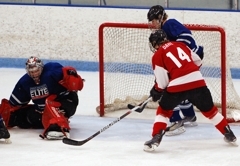 The biggest miscue by the Great Plains defense was allowing Team Wisconsin’s Brad Navin to sneak behind for a crushing breakaway goal in the third period. 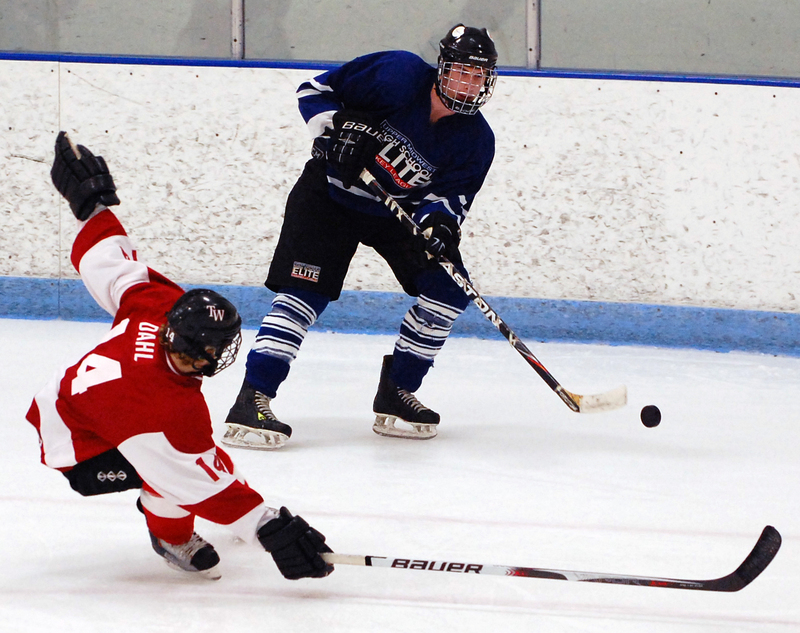 Great Plains rotates a large number of players in and out of its lineup, and missing from the defensive corps were Warroad senior Carson Gray and East Grand Forks sophomore Gage Ausmus. 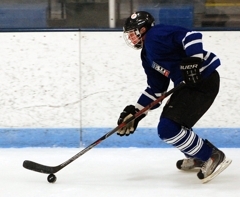 Brad Navin, a senior from Waupaca, scored the winning goal in the second period and added an insurance goal on a breakaway in the third to lead Team Wisconsin to a 4-2 victory over Great Plains on Saturday, Oct. 16, in an Upper Midwest High School Elite Hockey League game at Brainerd Civic Center Arena in Brainerd. 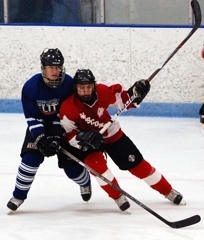 Navin, Team Wisconsin’s scoring leader with 18 points (13 goals, five assists) in 16 games, scored with less than two minutes remaining in the second period to put Team Wisconsin (8-7-1) ahead 3-1. Casey Fugleberg of Grand Forks Red River pulled Great Plains (6-9-1) to within 3-2 midway through the third period when he scored on a power play. 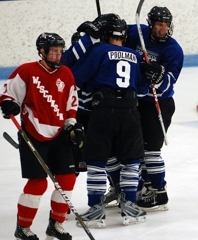 Navin scored again with 6 minutes, 41 seconds remaining to as Team Wisconsin regained its two-goal lead. 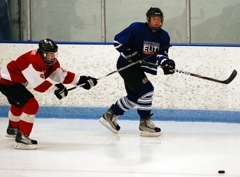 Ryan Dau of Hudson of Kyle Lee of Wausau West also scored for Team Wisconsin. John Simonson of Grand Forks Central scored the other Great Plains’ goal. 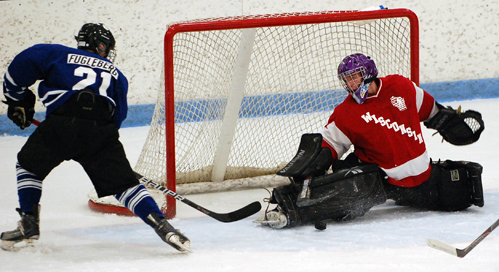 Saxton Soley, a senior from Eau Claire Memorial, stopped 26 shots to earn the win for Team Wisconsin. Great Plains goaltender Bryan Nies of Grand Forks Red River made 35 saves.